Have a Ball Bingo Review & Coupon Codes | Get Best Deals here! 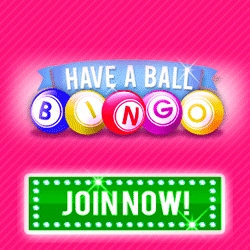 When you head over to haveaballbingo.com you will instantly be struck by the unique design of the glitzy homepage, which features a brightly coloured pink motif and exploding bingo balls, allowing your experience to start with a bang. Have A Ball Bingo launched in 2013, and it forms one of the sites on the Live Bingo Network. The Live Bingo network is a community of sites, including Landmark Bingo and Now Bingo, which offer players some great promotions that shouldn’t be missed! To get you up and running on Have A Ball Bingo players are given a fantastic welcome package which includes 7 days of no deposit bingo. Once you’re ready to start winning some larges prizes you will need to make your first deposit, for which you will receive a 300% first deposit bonus. The welcome package doesn’t end there, however, on your second and third deposits, you will receive a 150% and 100% bonus respectively. This gives you an overall welcome offer on Have a Ball Bingo of 550%, plus a week’s worth of no deposit bingo. Six £1000 Sliding Jackpots every evening. Buy one get one free bingo cards. On Have A Ball Bingo you will regularly see coupon codes appearing, either on the site or through social media channels. These codes are networked across all of the Live Bingo Network, so can be redeemed on multiple sites. You can now enjoy Have A Ball Bingo on you Apple and Samsung mobile and tablet devices, however, you do not have to have a specific app to do so. To play on your mobile all you do is simply enter the URL www.haveaballbingo.com and you will then be taken to a mobile optimised version of the site. Now simply log in to your account to enjoy your favourite bingo and slot games. If you are not a current member it will take you just a few minutes to get your account up and running. If you are already a member of the desktop version of the site, there is no need to re-register. As Have A Ball Bingo is part of the Live Bingo Network you will be able to choose from a large selection and variations of bingo games and rooms, usually with decent sized jackpots. There are 8 bingo rooms where you will be able to play bingo games including 30-ball, 75-ball, 80-ball and 90-ball bingo games. The ticket prices are from 1p upwards and most rooms will have progressive jackpots usually sitting at around the £2500 mark. If you prefer slot games, you will find the usual selection of 200+ slot games seen on Live Bingo Network. These games include Twin Spin, Aztec Gold, Irish Luck and Starburst. Both games from Cozy Games and other software providers can be found. As well as slots and Bingo you will also find some Scratch and Casino games, like Blackjack and Roulette. Very large 550% welcome offer. Generous no deposit welcome offer. Mobile compatible. No need for an app. Great selection of Bingo games. The site accepts most major credit and debit cards, as well as some other payment methods like Neteller and Paysafe Card. Minimum withdrawal is £1. Withdrawals can take up to 7 days to process. Follow Have A Ball Bingo on Facebook and Twitter. Gambling Commission license #: 38719. 24/7 live chat and email support provided on website. Have A Ball Bingo is a very similar site to many others on the Live Bingo Network, however, this is not necessarily a bad thing. Live Bingo Network sites allow players the chance of having a larger selection of bingo games, with jackpots usually sitting quite high, possibly increasing your chance of walking away with a profit. Overall, with 7 days of no deposit bingo waiting to be claimed you would be silly to not at least give this brand a try.